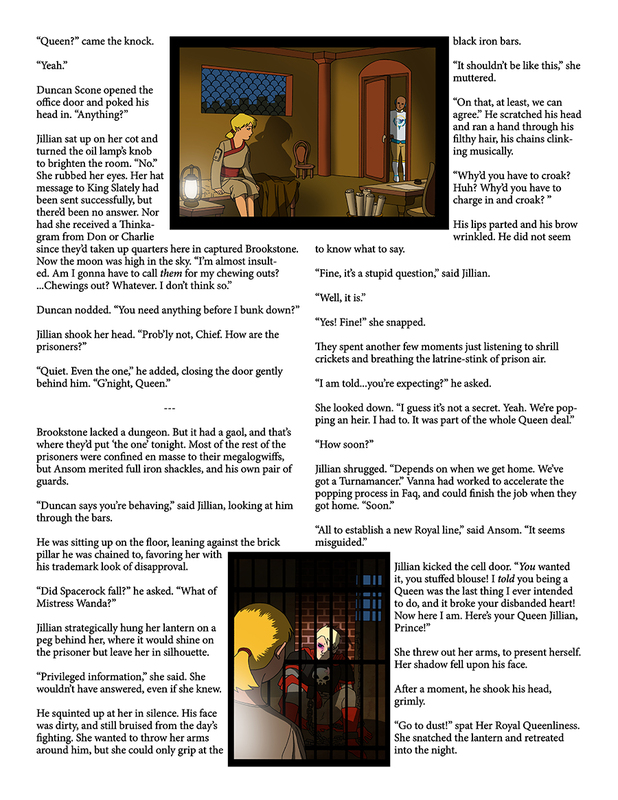 Difference between revisions of "Prisoner"
The captor [[side]] pays the [[upkeep]] for prisoners, but some issues are unclear. * Do [[Decrypted]] prisoners (normally zero upkeep) have upkeep? None of the sides that have taken Decrypted prisoners have commented on the issue, which seems odd. Does this mean the captors are actually paying for the Decrypted prisoners? If so, what does this imply about the "zero upkeep" cost of Decrypted? Is it actually being paid by someone other than their side, possibly the [[Arkenpliers]], or [[the source]]? A Prisoner is a unit that has been captured by another side. The side that has captured them can manifest or remove shackles from them at will. It is also possible for the capturing side to give a prisoner orders, though the lack of Loyalty presumably makes it easy for the captive to disobey, and it is implied that rulers cannot order prisoners disbanded. Prisoners cannot normally receive Thinkagrams,Erf-b3-p7 not even from the side that captured them. There are special exceptions. Jack Snipe has implied that Charlie is capable of doing so, and he appears to have done so with Hilary. Wanda, attuned to the Arkenpliers, can see through the eyes of prisoners with natural thinkamancy specials, and when linked with a Thinkamancer she can see through the eyes of any imprisoned decrypted unit. Prisoner casters are unable to use juice and therefore cast,Erf-b3-p9 but they retain some minor aspects of their discipline that don't take juice. For example, Jack Snipe has demonstrated highly skilled ventriloquism, lip reading, and sensory acuity, while Maggie as a prisoner was able to control her strands of thought similarly to lucid dreaming and mindful meditation. It is also possible under unusual circumstances for an imprisoned caster to cast using juice from an external source, though they are unable to retain it and must use it as they receive it. Casters will also not recover any juice while prisoner at the starts of the turn. If or when they are eventually repatriated, their juice reserve will be the same that it was the moment they were captured. Certain forms of Dirtamancy are nearly impossible to breach by a prisoner, but are far more vulnerable if said prisoner is repatriated. If they have an heir, their heir will become ruler in their place. There is currently conflicting information on what will happen if they do not have an heir. According to Hvs.tCF 9, this will make field units disband and everything else go neutral, leaving the side frozen in time as if the ruler was killed. If the ruler is repatriated, the side will resume as before, albeit with all field units still gone. IPTSF Text 68, however, suggests that field units will continue to live so long as the ruler prisoner remains alive and on the same side. "Will", "strength of spirit", and other unquantifiables mentioned by the Book of Canon. Number of guard units assigned to guard the prisoner. They must perform no other duties. Number of captor side's units in the prisoner's hex. Level of the city they are held in (if applicable). Additional precautions taken by the side, such as the city's design and various restraining devices. Level and specials of the prisoner, such as minor tricks or skills of a caster. Non-commanders escaping is unheard of, but Parson's Mathamancy Bracer implies that they do have an infinitesimally small chance. Prisoners left alone in a hex will be automagically freed, even non-commanders. A caster link between Maggie and Wanda has also demonstrated the ability to use the Arkenpliers to sever the g-string that connects a prisoner to the capturing side's ruler, releasing the prisoner. The captor side pays the upkeep for prisoners, but some issues are unclear. Do Decrypted prisoners (normally zero upkeep) have upkeep? None of the sides that have taken Decrypted prisoners have commented on the issue, which seems odd. Does this mean the captors are actually paying for the Decrypted prisoners? If so, what does this imply about the "zero upkeep" cost of Decrypted? Is it actually being paid by someone other than their side, possibly the Arkenpliers, or the source?